* Amazon Pays Billions in Taxes: Find out why the lying and obsessing of some over the fact that Amazon didn’t pay enough taxes is a false and unbiblical delusion. 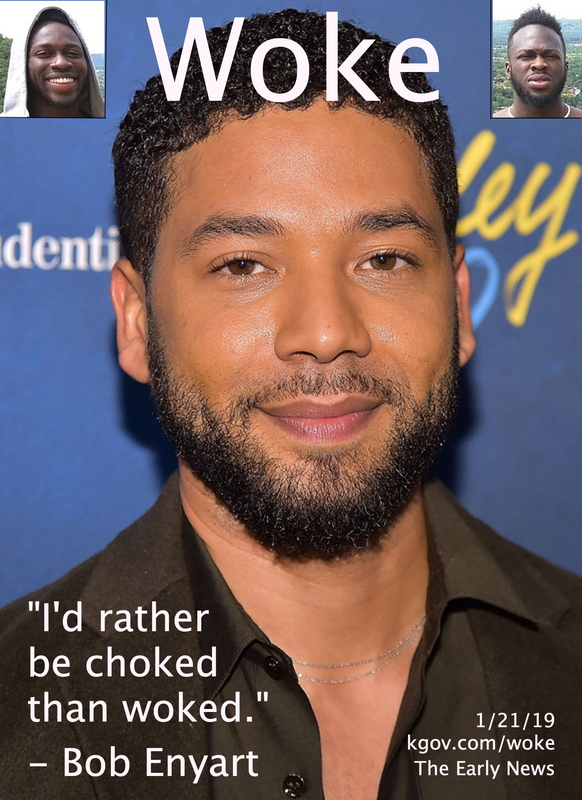 * Channeling Jussie Smollett: Get an update on the hoaxes of Jussie Smollett and Al Sharpton and witness another example of why we have to keep Bob Enyart Live on the air so we can all get a biblical view of the news (sometimes before it even happens). * App Attack: Hear about the Mobile Apps that you can’t stop, or even get rid of. And the one’s you don’t even know might be listening, (hopefully listening to solid biblical teaching like you’ll find on God and the Death Penalty, Mount Moriah), and Bob’s Monthly Bible Study. * Is Your Public School Showing? Bob and co-host Doug McBurney discuss the Tide Pod Challenge and how it is a tragic, but accurate gauge over people’s overall parenting skills. * Love Your Politician: Hear how one Trump supporter accused your host of not loving Donald Trump, but. * Truth & Justice Need Your Help: Jesus Christ is The Truth, the Bible is a criminal justice text book, and the voice of Bob Enyart Live is critical to getting those messages, and manifold others out. So please consider clicking on over, right now, to help and give what you can to keep Bob on the air for another year. * KGOV Hate-Crime Naming Contest: We conservatives have always observed the obvious, that all murder, etc., involves hate. That should prevent us however from recognizing the biblical principles involved in prosecuting those who make credible threats, not only to individuals but to entire groups of people. [Update: On the air on Feb. 18, 2019, Doug McBurney suggested a $40,000 prize for the listener who won our crime-naming contest, for coming up with a better name for what's called a "hate crime". Bob immediately retracted that impulsive, and completely impossible, generosity! ] So we would like to hear from you if you have a naming suggestion. It doesn't have to be witty. Just descriptive. Our own "group-threat crime" doesn't seem effective. Therefore you are invited to send your suggestion to Bob@kgov.com (even though the winner gets, well, nothing... nothing other than the satisfaction of helping uphold justice)! My position is that a credible threat, itself, is a crime. Therefore a crime is more severe if it includes an additional credible threat to other victims. (We could call that aggravating factor "hate" or some other, more descriptive term.) So a crime is more severe than the harm done to a specific victim if that crime is part of an effort (conspiracy, etc.) to target an entire group of people so that they too will be harmed in some way, including possibly by them fearing even to go about their own business, or by prompting other criminals in solidarity to harm other members of the targeted group. One of the biblical principles that supports this is God's authorization of increased punishment for those who attempt harm, whether or not they may actually accomplish that harm. (See kgov.com/crime.) For example, if a Sunni stabs to death a Shia as part of an effort to get all Shiites out of his neighborhood, he does more harm, for example, than if he had murdered someone in an attempted robbery, etc. Of course, hating evil is a quality and certainly not a crime. And the left uses their "hate crime" mentality to promote the perversion of homosexuality. But those obvious truths aside, we Christians should not go soft on the kind of group-threat crime that we're discussing, nor abandon the related biblical principles. A kneejerk reaction against anything that liberals happen to be saying at the moment may be easy, and even fun, but it is not a shortcut to understanding justice. That is, don't despise liberals more than you love God.